IT WORKS BODY WRAPS - Mom Made That! It Works Body Wraps aka the Ultimate Body Applicator is an at home targeted body wrap that can help you to transform your body. 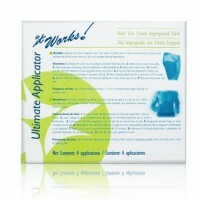 Whether it’s your tummy or your chin, It Works has developed a wrap that will aid in shrinking the area. Using the wrap is simple. You just apply it to your body, wrap area with saran wrap and wear for 45 minutes. The wrap results will appear over a period of 2-3 days until you can wrap again. Drinking LOTS of water during your wrap days is recommended to achieve maximum results. Try It Works body wraps today and see for yourself. Not convinced? Check out the It Works Body Wraps testimonials. Want more information? Contact 866-52-ORDER to talk to an Independent Distributor today.